ABSS Accounting is a fully integrated solution complete with inventory module, suited for small businesses that are owner operated. ABSS Accounting is single-user, fully integrated all in one solution. View a list of features introduced here. Handle not just accounting but also all your sales, marketing and stock control requirements, from issuing quotes to recording orders and printing out invoices as well as delivery orders, from one location. With the inventory management system you'll know exactly what's in stock, on order and committed. It's fully integrated with the sales and purchases features, so your stock listing is always up to date and accurate. You can also monitor performance by cost centre or department. Besides accounts payable and inventory features, ABSS Accounting has advanced invoicing and contact management features than ABSS BusinessBasics. 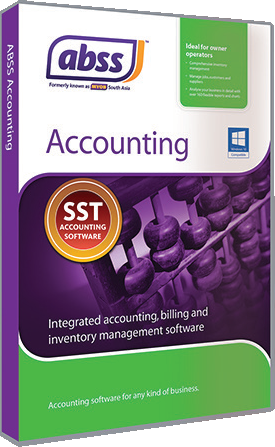 The latest release of ABSS Accounting ensures compliance with SST record keeping and reporting. Note: All prices are in Ringgit Malaysia, and, unless otherwise stated, DO NOT include installation, implementation and/or training. The trial version of ABSS Accounting is a fully functional version. You can either choose to work with the sample data file that comes with the trial version, or create a new data file for your company. In either case, the trial version works for 30 days, and you can enter your transactions into the system, print out the documents, view reports, and see how easily MYOB fits in your business. If you create a new data file, you can continue using it after the 30 day trial period if you purchase a licence, so you need not start over. "I am impressed by your prompt responses!" © 2012 DeltaTech Computer Systems & Solutions (SA0205092-A). All Rights Reserved.